The Impression Obsession team's challenge today is to create a card with a Halloween theme. I thought it would be fun to create a little Halloween wreath! 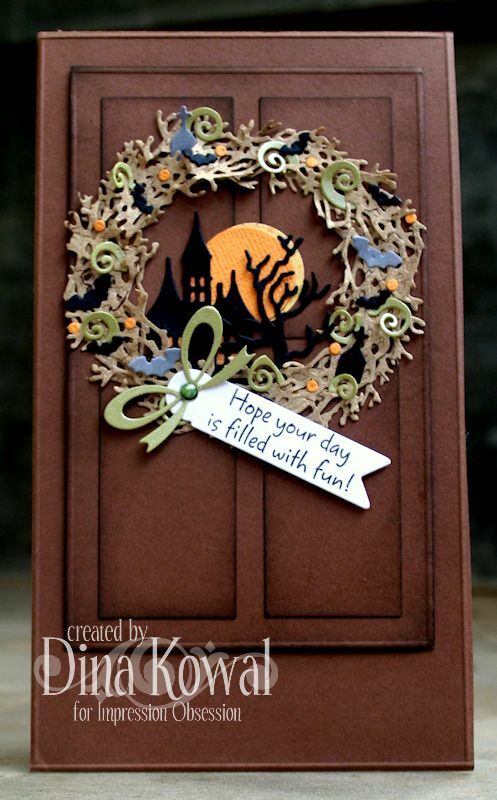 I created the door panels with rectangle dies and my Scor-Pal. I used several I.O. dies for the wreath - Twig Wreath, Halloween Hill, Nest/Hole, Flags, and Fancy Ornament. I mentioned earlier in the week that I used the cut-out swirls from the Ornament die on this card - did you see? The bow is from that die set too. The sentiment I used can be found HERE. P.S. I'm also entering this in this month's DIE-CUTS challenge over at Oozak! This is so unique, love it. Looks like my front door. lol. Very clever. You've managed to make the door 3D ! Wonderful details and very creative. This is just cute as a button! 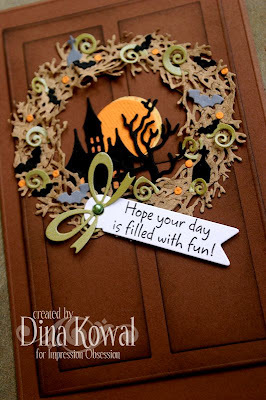 Love the idea of a Halloween wreath & yours is just awesome! This is just too cool! It is adorable - great idea! Great card! Love the haunted house and moon behind the wreath. Thanks for sharing. Fantastic Door card! Awesome way to use the Haunted Hill die! Wow! What an awesome wreath! Great work! Thanks for joining us Oozak Challenges.